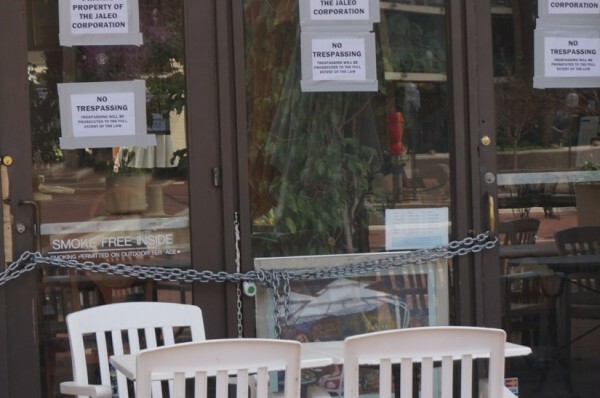 When Jasmine Cafe owner Eduardo Faubert found his restaurant, Jasmine Cafe, chained shut earlier this week, it marked a public view of a landlord-tenant battle. It also gave a glimpse as to the unusual way Lake Anne Plaza’s retail properties are managed. Most shopping centers are owned by one company and have a uniform management policy. Because of its mixed-use status, Lake Anne’s retail spaces are owned by individual owners and part of a condo association, Lake Anne Reston Condo Association (LARCA), that includes both residential and business members who sometimes have differing interests and priorities. While a typical shopping center such a Reston Town Center has standard leases and property management standards that regulate everything from business hours to signage, Lake Anne is subject to many different personalities and perspectives. That has both plusses and minuses, says Rick Thompson, president of LARCA. “It does allow for variation,” he said. “We are not a cookie-cutter shopping plaza. On the other hand, it allows for outliers. We have owners who take a sabbatical and shut down for two months at a time. That is not helping the plaza. We reasonably should have the expectation that they should be open certain days and hours. Thompson says the condo association and the voluntary Lake Anne Merchants Association both have rules, but they are not enforced as strictly as a typical commercial center. It is not likely that Lake Anne Plaza will transfer from the condo-owner system any time soon. Because residences are located above the retail stores in the main part of the plaza, it would be difficult to separate the two. Also, condo designation in Virginia is legislated, Thompson said. If Jasmine Cafe is shuttered for good — Faubert says he is trying to work things out with the property owner — it will mean the loss of a Lake Anne business of more than 20 years. Another Plaza mainstay, Lake Anne Pharmacy, is under contract but the new owners are working on a lease to a new pharmacy. Cafe Lakeside, the lunch counter located in the pharmacy, recently closed in anticipation of the sale. The new owners are hoping to lease the dining space separately, said Thompson. Another longtime business, Lake Anne Coffee House, is currently for sale. Meanwhile, how to revitalize Lake Anne Plaza has been the subject of conversations (and charettes and presentations and studies) with Fairfax County for many years. Republic Land Development was chosen last summer to redevelop Crescent Apartments and the area surrounding Lake Anne Plaza. However, the plaza itself — a historic property — will not be renovated. Nearby, though, more than 1,000 new residences (including additional affordable housing) and 193,000 square feet of retail and business space are planned, as well as an additional parking garage and a new entrance to the plaza. Those changes are expected to bring the needed density to Lake Anne that will boost existing businesses and attract new ones to the plaza, says Republic President David Peter.